I have a birthday card to send next week, but I'll be away. I decided to buy a stamp for it today then give it to my wife to post. Here's roughly how the conversation with the Post Office counter person went. Me: Hi, I'd like to send this to the Netherlands, please. Her: (Looks at scales) That'll be £1.55 please. Me: How long will it take to get there? Only it's for a birthday and I want to time it right. Her: We say a minimum of three working days. (She starts operating a machine to print a stamp). Me: So I'll be able to hold onto this and post it next week? Her: (Having trouble with machine) Yes. (She takes out the printed stamp and sticks it on. I notice a date on it). Her: That'll be £1.55 then. Me: Can I have it back, then? Her: I can just put it in the sack so there's no need to post it. Me: I want to post it next week, not today. Me: This stamp will still work next week? It's not time-limited? Her: (Looking at it) No. You'll need a £1.55 stamp on it. Me: That's taking some of the envelope with it. Her: I have to take it off and put a £1.55 stamp on it. Me: Can't you just leave it on? Her: I have to spoil it. 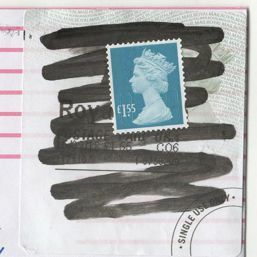 Me: You're spoiling the envelope, too. Her: I wish you'd told me this before. I expect it'll arrive, but whether it'll be held up because of the multiple stampage I don't know. Maybe I should post it today, just in case.